Green grapes, red grapes, black grapes, seedless grapes…who doesn’t love them? But do you know what is really enclosed inside each juicy globe you bite into? Curiosity got the best of me so I decided to do some research into this. It’s fascinating. Read on! Grapes are a wonderful late summer and fall produce to enjoy. We consider grapes a fruit, but botanically it is actually a berry! As it turns out, grapes have been cultivated for thousands of years and at least 10,000 varieties of grapes exist. As you may have noticed at the supermarket, grapes can differ widely in their sizes and colors. But did you know they can also differ significantly in nutritional value? Nutrition-wise, one cup of red or green grapes (European, like Thomson seedless) provides 104 calories, 1 gram of protein, 1.4 grams of fiber, 15 milligrams calcium, 0.54 milligrams of iron, 0.11 milligrams of zinc, and a whooping 288 milligrams of potassium! Grapes also provide a little bit of other vitamins like the vitamins A, K, E and B vitamins. If you think all fruits are a good source of vitamin C, you might be surprised to find that grapes are actually low in vitamin C (only about 4.8 milligrams per 1 cup of grapes compared to approximately 82 milligrams in an orange). 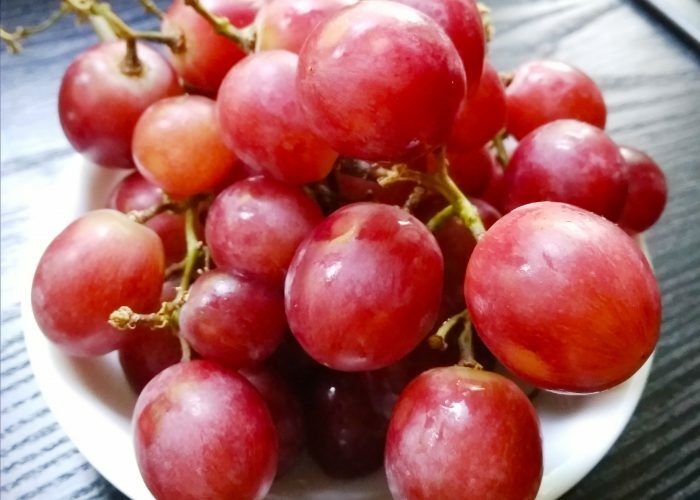 But one cup of large red globe grapes is equivalent to only about 15 grapes, so it can be easy to finish this amount in a sitting either to round out a main meal or to have as a snack. Remember that grape varieties can differ in nutritional value? Well, here’s a good example of this. Let’s compare the red or green European grapes mentioned above to the same weighted amount of raw green muscadine grapes (this would be roughly 25 grapes). This amount provides 86 calories, 1.22 grams of protein, 5.8 grams of fiber, 56 milligrams of calcium, and 0.39 milligrams of iron. This means these grapes give more than 4 times the amount of fiber and over 3.5 times the amount of calcium as the previous variety! But both varieties are still high in potassium and low in vitamin C.
Although more studies are needed, some possible health benefits include a reduction in the risk of cancer, heart disease, high blood pressure, as well as improving eye health and constipation. The healthful benefits of grapes may come partly from antioxidants and anti-inflammatory components within the grapes such as resveratrol, quercetin, lutein and zeaxanthin. Even those with diabetes can enjoy grapes, as long as the carbohydrate amount for the quantity eaten is counted into the overall meal plan. In the food arena, grapes make perfect pack-able snacks for school, work, camping or car journeys. Besides decorating cakes, fruit tarts, and gelatin, fresh grapes enhance fruit salads, vegetable salads and can be made into appetizers. They can be dried into raisins, roasted, pickled, candied, made into syrup, preserved in the form of fruit jams or made into wine. Raisins can be enjoyed as snacks, used in countless baked desserts, and even be thrown in to enhance curries, stews and slow cooker recipes. If you have a favorite recipe using grapes, do share in the comment section below! Covington L. 15 Types of Grapes To Know, Eat And Drink. http://www.foodrepublic.com/2018/05/20/15-types-of-grapes-to-know-eat-and-drink/. Published 2015. Updated May 20, 2018. Accessed October 9, 2018. Ware, M. What are the Health Benefits of Grapes? https://www.medicalnewstoday.com/articles/271156.php. Reviewed by Olsen, N. Updated November 15, 2017. Accessed October 9, 2018.